The 2014-2015 Ebola epidemic in West Africa had global impact beyond the primarily affected countries of Guinea, Liberia, and Sierra Leone. Fairley, J. K., P. E. Kozarsky, C. S. Kraft, J. Guarner, J. P. Steinberg, E. Anderson, J. T. Jacob, P. Meloy, D. Gillespie, T. R. Espinoza, A. Isakov, S. Vanairsdale, E. Baker and H. M. Wu (2016). "Ebola or Not? Evaluating the Ill Traveler From Ebola-Affected Countries in West Africa." Open Forum Infect Dis 3(1): ofw005. Background. The 2014-2015 Ebola epidemic in West Africa had global impact beyond the primarily affected countries of Guinea, Liberia, and Sierra Leone. Other countries, including the United States, encountered numerous patients who arrived from highly affected countries with fever or other signs or symptoms consistent with Ebola virus disease (EVD). Methods. We describe our experience evaluating 25 travelers who met the US Centers for Disease Control and Prevention case definition for a person under investigation (PUI) for EVD from July 20, 2014 to January 28, 2015. All patients were triaged and evaluated under the guidance of institutional protocols to the emergency department, outpatient tropical medicine clinic, or Emory's Ebola treatment unit. Strict attention to infection control and early involvement of public health authorities guided the safe evaluation of these patients. Results. None were diagnosed with EVD. Respiratory illnesses were common, and 8 (32%) PUI were confirmed to have influenza. Four patients (16%) were diagnosed with potentially life-threatening infections or conditions, including 3 with Plasmodium falciparum malaria and 1 with diabetic ketoacidosis. Conclusions. In addition to preparing for potential patients with EVD, Ebola assessment centers should consider other life-threatening conditions requiring urgent treatment, and travelers to affected countries should be strongly advised to seek pretravel counseling. Furthermore, attention to infection control in all aspects of PUI evaluation is paramount and has presented unique challenges. Lessons learned from our evaluation of potential patients with EVD can help inform preparations for future outbreaks of highly pathogenic communicable diseases. Fairley, J. K., P. E. Kozarsky, C. S. Kraft, J. Guarner, J. P. Steinberg, E. Anderson, J. T. Jacob, P. Meloy, D. Gillespie, T. R. Espinoza, A. Isakov, S. Vanairsdale, E. Baker and H. M. Wu , “Ebola or Not? 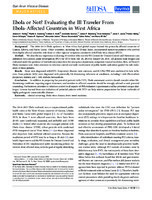 Evaluating the Ill Traveler From Ebola-Affected Countries in West Africa.,” NETEC Repository, accessed April 22, 2019, https://repository.netecweb.org/items/show/136.